On the 16th of September of 2011 in Baku Park Hyatt hotel The Center for National and International Studies held the conference “ The identity searches of the Turkic states in the 21st century: back to the pre modern times?” and presentation of the book “The Identity dilemmas of the Turkic states in the 21st century ” (CNIS, 2011). 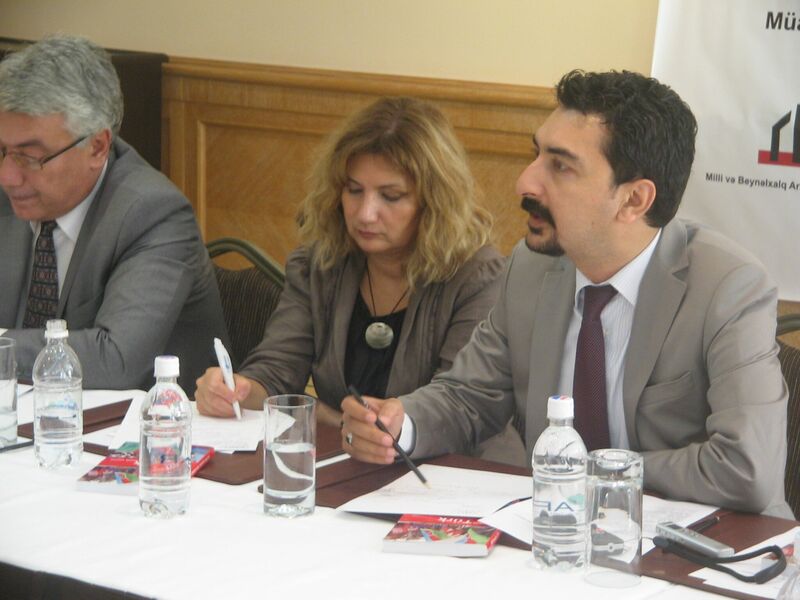 The conference was concluding the series of the round tables, conducted by the CNIS during the 2010-2011 years with the support of the National Endowment for Democracy. First in the Muslim East, in the early 20th century Azerbaijan and Turkey built the European style modern nation states. The main advantage of the states was their democratic, secular nature and based on the liberal freedoms founding legislation acts. After the cold war, especially in the 2000s, profound political and economic changes took place in both states. Nowadays Azerbaijan is moving farther away from the model of democratic republic founded in 1918, while in Turkey the traditional balance of state institutions is undergoing major transformation..
Do these political changes influence identity of Turkic nations? If yes, are there any threats related to these developments? Do these changes in foreign and domestic policy bring the states and nations to the time before formation of the modern nation states? And finally, do these changes affect the relations between two nations and states? These and other questions were in the center of analysis by the speakers – the guest from Ankara University Tasansu Turker, president of th CNIS Leila Alieva, chair of the civil Forum Eldar Namazov, and director of the Research Center Atlas Elxan Shahinoglu. Dr. Tasansu Turker focused on peculiarities of formation of the modern nation state in Turkey. He analyzed the content of concept of nation in Turkey, which emerged on the basis of encompassing power of meaning of “ osmanli” and – on the other hand, ideas of “turkism” – on the other. Leila Alieva focused on close connection between the political and national identities during the formation of the modern nation state in Azerbaijan of the early 20th century and analyzed the same processes in the post-Soviet transition, showing clear dependence of these processes on the identity and background of the ruling elites. In turn, Dr.Eldar Namazov stressed the role of the societal identity and characzterized general trends of foreign policy, reflecting the multiple identotites of Azerbaijani people- Turkic, Muslim, Fomer Soviet , Caucasus and Europe. He agreed, that identity of ruling elites also plays role in priorotization of certain directions of foreign policy. When the elite stays too long in power, the factor of self – protection contributes to the foreign policy behaviour. Dr. Shahinoglu described the current stage of Azerbaijan- Turkish relations and various views characterizing the state of these relations. Among positive developments, such as idea of economic confrnederation GAT ( Georgia-Azerbaijan-Turkey), he stressed, that there were serious problems in these relations, naming certain issues of discord between the brotherly nations, existing today. He mentioned still unresolved issue of visa free regime for Turkish citizens in Azerbaijan, the issues of gas transit, PKK, insufficient level of economic cooperation and until recently -Armenia-Turkish rapproachment. Tasansu Turker, in his turn, added the issue of Cyprus. The audience, which included guests, along experts community from Baku, from Lankaran, Shaki, Ganja and Lahic, have actively contributed to the discussion by asking questions and making interventions on the topic.